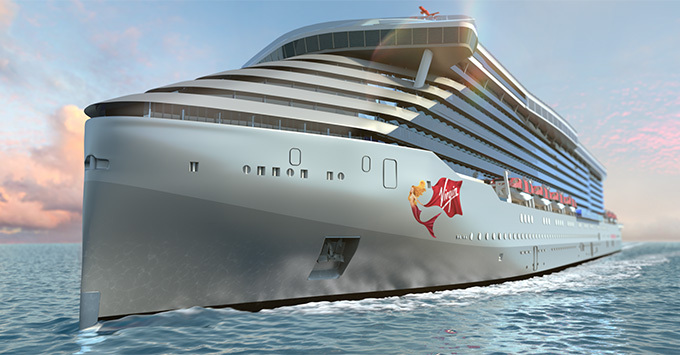 (5:05 p.m. EDT) -- A cruise for non-cruisers that's "an epic sea change" from what's currently available: that's what Virgin Voyages -- the latest brand helmed by business mogul Richard Branson -- aims to offer when it launches in 2020. During the State of the Industry panel held last week at the 34th annual Seatrade cruise conference in Fort Lauderdale, Virgin Voyages' president and CEO, Tom McAlpin, gave eager cruisers (and non-cruisers) a glimpse of what the ground-breaking brand hopes to accomplish. "We are not trying to be a disrupter for the travel experience," said McAlpin. "We think about it more broadly; we want to be a new travel experience." The first Virgin Voyages ship will sail Caribbean cruises out of Miami, beginning in 2020. The line is relying heavily on the upscale "hip," "witty" and "cheeky" personality that Virgin already enjoys with its customers, McAlpin said. The ship will be adults-only, as Cruise Critic reported in October 2017. "A chemical reaction occurs when you put children in water," McAlpin said. "They scream." The minimum age for the ships will be 18. "Moms and dads, they need a break too," he said. "We're not for all people." It will focus on immersive entertainment; there will be a casino but no Broadway shows. "If they want to see a Broadway show, they'll go to Broadway," McAlpin said. There's a chance arrival times into port will be much later than the industry standard of roughly 7 to 8 a.m. Added McAlpin: "Our guests are young at heart. Maybe they don't want to go out at 7 in the morning, so [the ship] might come in later and then leave later." The majority (86 percent) of cabins will have balconies, and 93 percent will offer ocean views. Shore excursions will be more off-the-beaten-path. Aesthetically speaking, the ship will be mid-sized (carrying 2,750 passengers) but its design will be inspired by a sleek super yacht with silvery gray colors and smoked glass. Some of the creative lighting elements that Virgin brought to its airline will also be present, McAlpin said. Virgin Voyages' reservations call center will be located in the same building as the rest of the company's staff, in line with the parent company's culture. There will be an opportunity for cruisers to bundle vacation packages, with Virgin Atlantic flights and Virgin hotels. Little else is known about the new ship, which will be the first of three (the others are expected to launch in 2021 and 2022). McAlpin hinted there would be industry firsts in terms of the food and beverage offerings onboard, and cabin design, but stressed work still needs to be done to determine what customers want. "A voyage is a journey," said McAlpin. "We want people to come away saying this was the best week of my life."